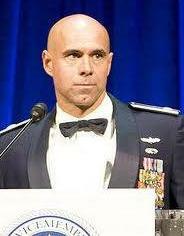 August 20, 2010 - Lieutenant Colonel Fehrenbach has served in the United States Air Force for over 19 years as a jet pilot and has flown numerous missions against the Taliban and Al-Qaeda targets, including the longest combat mission in his squadron's history. Fehrenbach was also hand picked to fly an F-15E Strike Eagle above the nation's capital on September 11, 2001, when the nation was under terrorist attack. Throughout Lieutenant Colonel Fehrenbach’s career, he has witnessed a number of servicemen kicked out of the military under the military’s current policy, “Don’t Ask Don’t Tell”. Don't Ask, (DADT) Don't Tell is the common term for the policy restricting the United States military from efforts to discover or reveal non open gay, lesbian, and bisexual service members or applicants, while it can bar those who are openly gay, lesbian, or bisexual from military service (federal law Pub.L. 103-160 (10 U.S.C. § 654). As it exists, DADT specifies that the "don't ask" part of the policy indicates that superiors should not initiate investigation of a service member's orientation in the absence of disallowed behaviors, though credible and articulable evidence of homosexual behavior may cause an investigation. Violations of this aspect through persecutions and harassment of suspected servicemen and women resulted in the policy's current formulation as don't ask, don't tell, don't harass, don't pursue. In 2008, Lieutenant Colonel Fehrenbach was notified by the Air Force that a civilian acquaintance had identified him as gay. The Air Force charged him under DADT with damaging its good order and discipline. Fehrenbach had decided he would resign from the Air Force. “I wanted a quick, quiet, fair and honorable discharge,” said Fehrenbach. However, with the possibility of a change in DADT policy, Fehrenbach decided to contest the charge that his presence hurt the Air Force. Fehrenbach sought a public debate on the military’s stance on gays in the military, by speaking in public and holding demonstrations. On May 19, 2009, Fehrenbach was on the Rachel Maddow Show, which airs on MSNBC. Fehrenbach spoke on the military’s policy on “Don’t Ask Don’t Tell.” Fehrenbach reported that there were a number of good men and women who were being kicked out of the military because they are gay. He further stated that the gay men and women, which the military had spent hundreds of millions of dollars on in training, were no threat to the military or their servicemen and did not interfere with military effectiveness. He further stated that many of these men and women had served in combat duty without any problems. One year later on May 27, 2010, the U.S. House of Representatives approved the Murphy amendment to the National Defense Authorization Act for Fiscal Year 2011, on a 234-194 vote that would repeal the relevant sections of the law 60 days after a study by the U.S. Department of Defense is completed and the U.S. Defense Secretary, the Chairman of the Joint Chiefs of Staff, and the U.S. President certify that repeal would not harm military effectiveness. The Following day the U.S. Senate passed the bill. Now that the bill is moving forward many are wondering why the military is still kicking people out of the military under “Don’t Ask Don’t Tell.” On August 13, 2010, Air Force Lieutenant Colonel Victor J. Fehrenbach announced that he has filed a request for an injunction to stop his removal from the Air Force under Don't Ask Don't Tell. Lieutenant Colonel Fehrenbach filed a request for a temporary restraining order in U.S. District Court in Idaho, arguing a discharge will cause him irreparable harm. The Air Force has reported Lieutenant Colonel Fehrenbach’s case is still undergoing review at the Air Force Review Boards Agency (SAF/MRB). After the board makes a recommendation, it is considered by the Director of SAF/MRB. After a decision is reached by the Director, SAF/MRB forwards notice through the Assistant Secretary of the Air Force for Manpower and Reserve Affairs to the Secretary of the Air Force. The Secretary may either decide to bring the case to his level for decision, or leave it with SAF/MRB for decision. Unless advised that the Secretary will take more time to decide, SAF/MRB may take final action once 10 days have passed from the Secretary of the Air Force having received personal notice that the matter is ready for decision. There is no time limit on how long the Secretary may consider a case. Attorneys for the Department of the Air Force and the Department of Justice are reviewing Lt. Col. Fehrenbach's request for an injunction and will file a response in Federal Court.